Coriander (Coriandrum sativum) has a pungent, citrus flavour to the leaves that some people adore and others detest. In fact, its name is actually derived from the Greek word for bug as they thought that is smelt like one that had been squashed! Coriander grows best where the climate is hot and humid. In most parts of Western Australia, we can provide the heat that coriander loves but not the humidity so growing from autumn to spring is usually the most successful. All parts of coriander can be used. The leaves are used in Chinese, Thai and Mexican dishes to give a spicy flavour and the chopped root can be included in dishes that require more cooking. Coriander seed, including those purchased in jars at the supermarket, is usually powdered and used in both sweet and savoury dishes. There are several varieties of coriander. The one available in the garden centres is especially grown for it’s dark green foliage and good pungency and, in some cases, is a slow bolt strain making it longer lasting. Slow bolt coriander will grow to about 60 centimetres tall. There are also varieties grown just to harvest the seed for cooking as they have less leaf and will bolt very quickly to produce flower heads. Many gardeners struggle to grow coriander but there are some tricks to its’ success. Coriander has a terrible habit of bolting to seed whenever the conditions that it is in changes. If the weather turns from hot to cold or cold to hot, coriander will decide that it is time to produce more seed and will send up flower heads from the centre of the plant. This is one of the reasons that people have trouble growing coriander, especially if they decide to transplant it in to a larger pot as this is also changing the conditions in which the plant is growing. There are several ways to grow strong and healthy coriander without it bolting to seed. The first is to choose the plants at the garden centre carefully. Plants that are labelled as slow bolt coriander will be more uniform and slower to produce flower heads so will be produce leaves for longer. Also, choose pots where the seeds have been direct sown straight into the pot. This is obvious if the pot has seedlings growing over the total surface of the soil and not just directly in the centre. Finally, buy your plants when they are just a few centimetres tall so that the coriander is less established and more likely to cope with transplanting. 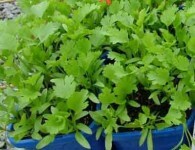 The second way of achieving a beautiful and continuous lush crop of coriander is to grow it directly from seed in situ. This is not too difficult and is a very fast and inexpensive process. The first step to direct sowing coriander is to choose a pot that is about 25 centimetres across. Fill it to about three centimetres from the top with a premium potting mix that contains slow release fertiliser and wetting agents. Sprinkle about ten seeds across the surface of the soil which, since each seed produces two plants, will supply you with twenty plants altogether. On top of the seed, put at least a centimetre layer of potting mix and water with a seaweed solution. Place the pot in a warm but sheltered position, perhaps next to a brick wall, and in a matter of days the coriander seed will have germinated. When it has reached two centimetres tall, move the pot into part sun to encourage the growth to be strong and the leaves more flavoursome. Coriander doesn’t tend to get affected by too many pests and diseases but a regular water with a seaweed solution and organic liquid fertiliser will encourage it to maintain its’ vigour. Coriander is very fast growing and should be harvested often by taking the outside leaves from the base of the plant. The best flavour comes from the younger leaves so it is best to accept that it is a short-lived plant. By seeding a new pot of coriander every two or three weeks, a continuous supply of coriander can be achieved fresh from the garden since, when one pot is finishing, the next will be ready to harvest. Vietnamese Mint (Polygonum odoratum) is an alternative to coriander. This plant is not a mint or indeed a coriander but its’ flavour is definitely that of spicy coriander. It is a perennial that thrives in damp, rich soil and part shade and its’ leaves can be a valuable replacement for coriander in dishes such as laksas and curries. Growing coriander is well worth the effort if just to add a touch of the exotic to both the garden and the dining table.